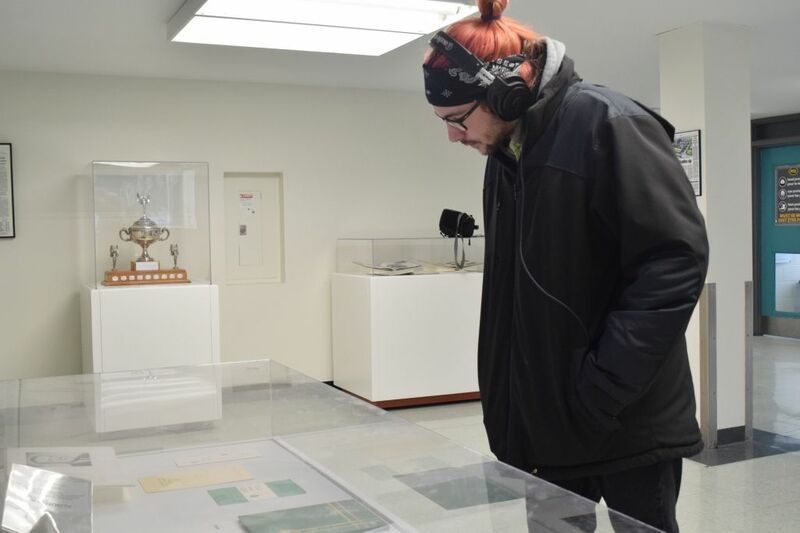 Algonquin student Nick Nagel looks over an artifact case at the Algonquin Legacy Centre display Jan. 31. Two students of Algonquin’s applied museum studies program have put together a unique display celebrating the college’s 50th anniversary. A room filled with artifacts collected from the past 50 years, assisted by a slideshow, forms the Algonquin Legacy Centre which is located on the first floor of C-building in the hallway directly connecting to A-building. The idea for the project came from Christine Brennan, the head of events for Algonquin. Betty Liang, one of the students responsible for the display, said the school wanted a more permanent way to celebrate the 50th anniversary. 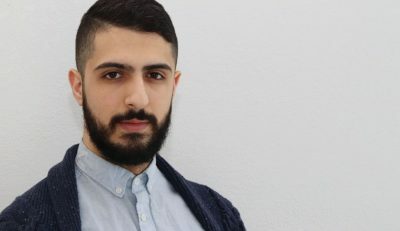 Liang and co-creator Margee Cantor started the project in May 2017 and finished it in June of the same year. 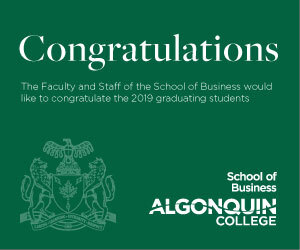 One of the most eye catching objects featured in the Legacy Centre display is the Algonquin College school of business Student Government and Scholastic Achievement trophy. Which is a large trophy goblet atop a wooden base adorned with small plaques with the names of former recipients. The trophy was first awarded in 1971 and last handed out in 2006. “Through memorabilia and artifacts, this exhibit showcases the history and achievements of the college community, its employees and students,” reads a mural on the wall that sums up the idea behind the Legacy Centre. It is unknown at this point whether the current Algonquin Legacy Centre will be a permanent fixture. Although both Liang and Cantor got the impression that the college was interested in keeping up this display or a display like this showcasing Algonquin legacy and community throughout the years up permanently. Two Algonquin students create Legacy Center celebrating college’s 50th anniversary Reviewed by Connor Wilkie on January 31, 2018 .